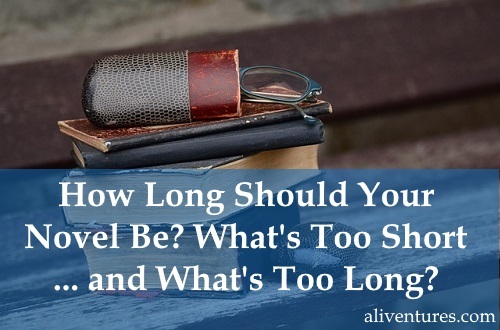 How Long Should Your Novel Be? What’s Too Short … and What’s Too Long? For some writers, “how long should a novel be?” sounds a bit like “how long is a piece of string?” They feel that their novel should be long enough to get the job done – even if that means it falls outside the bounds of what Readers and publishers might normally expect. The truth is that, while there’s not necessarily a “right” answer to this question, you do need to stick to industry norms if you’re aiming for traditional publication … and if you’re planning to self-publish, you’ll want to make sure that readers aren’t being put off by a too-short or too-long book. Where does the word count of your piece fall? Novel: Over 40,000 words. 80,000 – 90,000 is considered the sweet spot; under 70,000 or over 100,00 will be hard to sell to an agent/publisher. The Turn of the Screw (Henry James) – a shade over standard novella length at 42,000 words. Heart of Darkness (Joseph Conrad) – 38,000 words. A Christmas Carol (Charles Dickens) – 29,000 words. With the rise of e-readers, novellas have had a resurgence in popularity: they’re quick to get into and read, and they can be priced very cheaply. Some authors, like J.F. 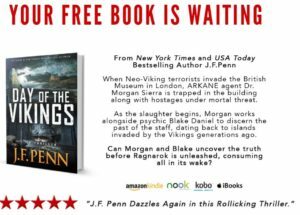 Penn, use a free novella to promote their email list – you can see a screenshot of her Day of the Vikings offer to the right (sign up and get your own copy here). Print publishers tend to be reluctant to take on novellas, though, because they’re uneconomical to print. So, if you’ve written a short novel, you may struggle to get a traditional deal … but it could work well for you as a self-publisher. If you’ve written a 30-40,000 word book, don’t describe it as a “novel” in your sale material: readers may feel cheated! You might want to do what J.F. Penn does and use “book” rather than “novel”. Phrases like “quick read” or “pacy read” can clue readers into the length (not all readers will necessarily be familiar with the fairly technical term “novella”). You’ll also want to consider pricing, especially if you also have novels out. For instance, you might price your ebooks at $2.99 for your novels and $1.99 for novellas. Not unreasonably, most readers will expect short novels to cost less than full-length ones. You might also want to consider using it as a cheap or free entry-point for readers new to your work (for instance, you could put it on Kindle Unlimited for free, run periodic giveaways, or use it as a permanently free incentive to get people to sign up for your mailing list). Should You Cut Down a Long Novel? Whether you’re seeking a traditional deal or publishing independently, a too-long novel is a problem. Novels that top 100,000 words often have more words than they need: most authors over-write, at least a bit, and cutting 105,000 words to 95,000 could make for a tighter, better-paced novel. Also, readers have certain expectations of novels. Many of these are structural (e.g. the novel will have an ending, major plot points will be resolved, the protagonist will grow/change in some way) … but one fairly basic expectation is how long the novel will be. Even if you’ve written a well-paced novel that’s not too wordy, it may not go down well with readers if it’s considerably longer than what they’d normally expect. In some genres, of course (fantasy and science-fiction especially), novels tend to run long. But in others (romances and Westerns), readers will normally expect shorter books. Ultimately, you’ll have to decide if your novel really needs to be long – you can’t do justice to the story and characters otherwise – or if you’ve written more words than necessary. You may want to get beta-readers, or a professional editor, involved at this stage. Aim for 75 – 95,000 words. This is a “normal” novel length in almost every genre; it’ll work fine whether you’re seeking traditional publication or whether you’re self-publishing. Another big advantage to keeping your novel to a standard length is that it won’t take you a huge amount of time to write. You can complete a 75,000 – 80,000 word novel in two years – from initial idea to publication (or sending out queries) – by working for just 30 minutes every day. Here’s my full plan for doing just that. Got questions? Disagree with me about how long novels should be – or whether it matters? Drop a comment below! The post How Long Should Your Novel Be? What’s Too Short … and What’s Too Long? appeared first on Aliventures.